By Rebecca M. Blank, University of Michigan and the Brookings Institution and Brian K. Kovak, University of Michigan. This brief is also published by the Center on Children and Families at the Brookings Institution as Brief #38. • Those remaining on welfare are a heterogeneous group, including short- and long-term recipients whose low wages or limited hours do not disqualify them from TANF as well as families who use the program during short-term economic disruptions in their lives. However, about 40 to 45 percent of the caseload is made up of long-term recipients who are not working or who work very sporadically. • Compared to women who left welfare and are working, the disconnected tend to have more barriers to employment, with less education, younger children, higher rates of mental and physical health problems, higher rates of substance abuse, and a greater history of domestic violence. • This brief recommends the development of a Temporary and Partial Work Waiver Program (TPWWP) to assist disconnected single mothers who face multiple barriers to securing and sustaining employment. A TPWWP would link families to medical and economic supports to prevent extreme poverty while providing more intensive case work assistance to ease the severity and duration of employment barriers. A recent body of literature has identified a growing number of low-income single mothers who face significant challenges to employment. This group includes long-term welfare recipients who have been unable to enter the workforce as well as women who have left welfare, in some cases through sanctions and time limits, but who are marginally attached to the labor market. These women tend to be very poor and face serious barriers to achieving economic self-sufficiency for their families. This brief highlights recent work by Rebecca Blank and Brian Kovak of the University of Michigan that describes the characteristics of these “disconnected” mothers and their households, and summarizes a recent proposal by Blank to address the serious barriers faced by disconnected mothers, assist them in moving to work, and link their families with much-needed government supports. A policy such as this, the authors argue, is necessary, since states now face more stringent federal work requirements. Those who remain on the rolls of the Temporary Assistance to Needy Families (TANF) program include at least three groups. First is a group of women who combine work with welfare receipt. Within this group are both short- and long-term recipients whose low wages or hours do not disqualify them from TANF. A second group uses cash assistance during short-term economic disruptions in their lives, and they tend to leave rolls relatively quickly. The final group is made up of women who are not working or who work very sporadically. They are long-term recipients who researchers estimate comprise about 40-45 percent of the TANF caseload. While one might expect that long-term recipients would make up an increasing share of the welfare caseload, the fact is that more disadvantaged women have left TANF at about the same rate as women who appear more “work-ready.” Since the implementation of welfare reform in 1996, more and more women have been involuntarily terminated from welfare because of sanctions—penalties imposed for failure to meet work or other welfare requirements—or because of reaching time limits. The Personal Responsibility and Work Opportunity Reconciliation Act of 1996 prohibits states from using federal welfare funds to support families after 60 months of benefit receipt; about one-quarter of states have imposed even shorter time limits. Many studies have noted that more disadvantaged women are more likely than others to be sanctioned or leave welfare due to time limits. Additionally, in 30 states, approximately 14.6 percent of adult welfare recipients have been moved from federally-funded TANF to state-funded welfare-like programs, often referred to as Special State Programs (SSPs). States use these programs to avoid counting some recipients in their calculations for various federal program requirements. However, in January of 2006, Congress passed revisions to the TANF legislation that requires states to have 50 percent of their current welfare caseload working or in work-related programs if their caseloads are at or above 2005 levels. (Following welfare reform, the 50 percent work requirement was reduced as state caseloads fell in all states. By resetting the base year to 2005 caseload levels, this recent legislation enacts much higher effective caseload work requirements.) In addition, for the first time states must include in their calculations women who are currently in SSPs. If states do not meet these requirements, they will lose part of their federal funding. Virtually no state now meets the 50 percent work requirements. The average state participation rate using the new counting rules would have been 30 percent in 2003. In order to avoid financial sanctions for their welfare programs, states must find a way to move more of their non-working TANF and SSP caseloads into work. The new federal requirements create a strong incentive for states to remove disadvantaged women from the caseload through time limits and sanctions: this may increase the number of disconnected women and their children who face serious poverty. How Many Women Are Neither Working nor on Welfare? The share of women who neither work nor receive cash welfare, often referred to as the “disconnected,” represent a growing share of all low-income single mothers. 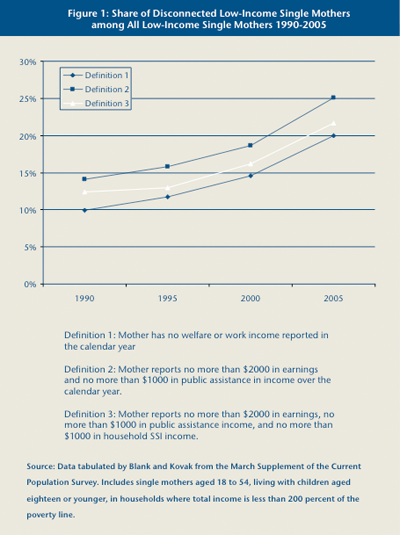 There are several ways to define “disconnected.” Definition 1 of Figure 1 classifies disconnected mothers as those who report no work and no welfare income over the entire year and do not report “schooling” as a primary activity. Definition 2 classifies disconnected mothers as those who are not in school, report less than $2,000 in earnings and less than $1,000 in public assistance over the past year. Definition 3 adds the additional restriction that yearly household SSI income be no more than $1,000. By definition 1, the share of low-income single mothers who are disconnected rose 71 percent in the nine years between 1995 and 2005, from 11.7 percent to 20.0 percent. The share reporting only limited work or welfare income (Definition 2) rose 59 percent, from 15.8 percent to 25.1 percent in that same 10 year period. The most restricted definition of disconnectedness (Definition 3) exhibits a 67 percent increase, from 13.0 percent to 21.7 percent. Who are these disconnected mothers? Table 1 describes the characteristics of disconnected mothers using Definition 3 in Figure 1 (little reported work, welfare, or SSI income). Just under half live in households with other adults, but they, like all disconnected families, are still likely to be quite poor. In 2005, reported personal earnings averaged around $200 (in 2005 dollars), and total household income averaged less than $10,000 a year. 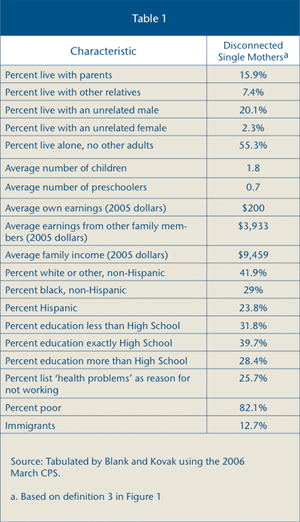 Roughly 80 percent had household income below the poverty level. About 40 percent of disconnected mothers are non-Hispanic whites, thirty percent are African American, and about a quarter are Hispanic. More than 70 percent of these women have a high school degree or less. About a quarter report that health problems are the reason for not working—suggesting a significant minority have some serious health problems. Twelve percent are immigrants. According to earlier estimates computed by Blank, the more expansive definition of “disconnected” single mothers includes some 1.7 million women. Including the 40 percent of recipients who are long-term TANF recipients and the single mothers in SSPs adds another 500,000 to the ranks of single mothers with severe economic disadvantages. Together, roughly 2.2 million women who head families do not support themselves either with welfare or with their own earnings. These women have on average 1.8 children each—translating to almost 4 million children who live in these severely economically challenged families. Why Aren’t Disconnected Women Working? A history of domestic violence or violence in a current relationship. Additionally, disconnected women are more likely to live in central cities, where welfare caseloads have fallen less than in other parts of the country. Most welfare leavers who have trouble finding or keeping employment face one or more of these barriers. A study conducted by Pamela Loprest at the Urban Institute found that 57 percent of those not working had multiple barriers to work compared with only 17 percent among those who had found work. Another study by Mathematica scholars LaDonna Pavetti and Jacqueline Kauff in Minnesota found that all women who had exceeded their time limit in one county faced either serious cognitive limits, mental and physical health issues, lack of community and social networks, and/or limited management and decision making skills. Public attention over welfare has focused on moving women into work, but has not yet adequately addressed the reality that some women are not making this transition. It is time to rethink policy for women who face serious disadvantages and for whom working full-time or working steadily is not possible. These women are increasingly losing access to welfare and will continue to do so under new welfare requirements. Many low-income Americans who are disabled for at least twelve months and who are unable to engage in “substantial gainful activity” rely on the federal Supplemental Security Income (SSI) program for benefits to make ends meet. Most disconnected mothers, however, lack access to this program. Their disabilities may not prevent some workforce involvement, a requirement for SSI receipt. Policy analysts have increasingly begun to recognize the need for a support system that provides temporary or partial disability, such as that used in Europe and in private disability systems in the United States. Blank proposes that states create a Temporary and Partial Work Waiver Program (TPWWP) to assist the growing number of women and their children who are receiving support from neither TANF nor from SSI and who face multiple barriers to securing and sustaining employment. Women who are not receiving TANF benefits are less likely to receive other services for their children and themselves, including food stamps and Medicaid. Given recent changes in welfare policy, states must also find ways to assist long-term TANF recipients who require more help in moving to employment. The TPWWP could assist both of these populations by granting much needed cash assistance and more time and flexibility to find employment, while continuing to work toward the ultimate goal of greater economic self-sufficiency through some level of employment, if possible. A TPWWP would link families to medical and economic supports to prevent extreme poverty while providing more intensive case work assistance to ease the severity and duration of employment barriers. Caseworkers assigned specifically to this program would assess families’ health problems, personal skills and limits, and economic situation. If TANF or SSI support was not feasible, caseworkers would determine eligibility based on how much work could realistically be expected and how long support should be provided before a reassessment is in order. Caseworkers would determine whether barriers to work should be considered full or partial and would calculate TANF-level cash benefits based on the percentage of time mothers could be expected to work. They would also assist families in applying for other programs such as food stamps and Medicaid. An important component of case management would include referrals to other available services to address particular barriers, such as depression, substance abuse, and lack of job readiness, among others. This proposed program would be set up with separate federal funding that states would administer as part of their TANF-related programs. Participants would be outside the standard TANF caseload counts. Entry into the program could occur via referral by a TANF case manager for cases identified early as hard to serve. Other points of referral might be after a TANF recipient is sanctioned, has reached a time limit, or has been a denied an SSI application. Or, a recipient could simply request to be placed into the program if she met eligibility requirements and was not currently connected to other public assistance. While TPWWP participants would not be counted as part of the state’s TANF caseload or subject to the forty-hour a week work requirement, participants would continue to face work and other requirements and could be sanctioned if they did not obtain referred services and or meet employment expectations. This system would give states the flexibility to respond to families for whom TANF welfare-to-work programs are not adequate. Different states could adapt this program based on their resources and the needs of their clients. Not all of these single mothers will be employable in the short- or even in the long-run, and some may be best served by being placed in the 20 percent of the TANF caseload that federal law allows to be waived from time limits. However, even highly disadvantaged women can be encouraged to work at least part time and as regularly as possible, and states can assist them even in circumstances where TANF funds cannot be used. This system recognizes that family circumstances are dynamic and gives states the ability to adapt to a family’s changing economic needs so that a woman who may not currently be able to hold a job, but who may be able to do so in the future, is supported during that transition. The drawbacks of such a system include higher cost, as well as complex case management and the creation of a new TANF category. Most of the services called for in this proposal, however, already exist in states through TANF and other programs. However, many states already offer extensive front-end assessments of applicants to public assistance programs and women who would use this new TPWWP would use existing community services. Existing state or federal resources could be leveraged to address women’s barriers to employment in a way that would benefit states (for example, through caseload reductions) as well as severely disadvantaged families who are currently disconnected from both work and public assistance. The costs of this program depend on a variety of factors that will vary from state to state; however, to provide a ballpark cost estimate, some conditions are assumed. First, disadvantaged families will require extensive assessments that will cost about $500 per family. Caseload and tracking services for each family could reach $600 a year. The cost of paying caseworkers and providing the supports they need for their job would be about $60,000 a year for every 100 cases. Assuming that approximately 50 percent of program participants would require some additional services during the course of a year, and keeping in mind that those services and their costs vary widely, the estimated annual cost of additional services may average $1,000 for service recipients, or $500 per family among all families in the program. In addition, virtually all women in the program would receive some cash assistance in the form of full or partial benefits. If the average family receives two-thirds of the average state monthly benefit, this would cost about $300 a month. The overall cost for the average new entrant into this program for the first year is estimated to be $5,200. This includes $500 in assessment costs, $600 in case management costs, $500 in other services received, and $3,600 in cash benefits. Using a high take up rate of 25 percent of the 2.2 million women estimated to be disconnected from welfare and work or who are long-term non-workers on welfare, this proposed program may cost a total of $2.8 billion annually. Some of this spending might come from existing funds and TANF dollars, but the primary cost to states would be setting up referrals, providing assessment and case management, and staying in contact with disconnected women to encourage them to increase their skills and work effort. The Temporary and Partial Work Waiver Program described in this brief is one way to address the needs of the families disconnected from work and welfare. Six additional policy efforts could reinforce existing welfare-to-work efforts and help low-income women and their children escape poverty. States can ensure that low-income families who are not receiving TANF are connected to other programs such as food stamps, Medicaid, and the Earned Income Tax Credit, among others, for which they are eligible. States should ensure that subsidized mental health services are available to low-income persons. Federal and state governments should expand health insurance programs so that adults and children in low-income families have access to medical services. States should subsidize participation in programs that address substance abuse problems and domestic violence. Federal statutes should be amended so that months in which TANF recipients combine work with welfare do not count against the lifetime 60-month time limit for receiving benefits. Schools can be a point of contact for children whose families are disconnected from major public assistance programs. They can help monitor children’s health and work with parents to connect them to assistance, ensure eligible children utilize school breakfast and lunch services, and identify children who are subject to abuse or neglect. Currently, the Administration for Children and Families within the U.S. Department of Health and Human Services has launched several demonstration projects to test programs that go beyond current welfare-to-work efforts in helping mothers move into work. The PRIDE program in New York City, which is similar to the TPWWP proposed in this brief, has found that a significant share of TANF recipients do not qualify for SSI and also do not seem appropriate for traditional welfare-to-work services. These efforts may provide insight about the most effective ways to support disconnected mothers while encouraging work among single mothers who have trouble maintaining employment. A public conversation about women for whom current welfare-to-work efforts are not enough is long overdue. While in the past the situation of these women has not captured much public attention or sympathy, interest is growing about the research and demonstration projects aimed at the hard-to-employ. This change is probably in part due to the growth in numbers of the hard-to- serve and the fact that mothers’ economic instability, poverty, and joblessness affects their children. The success of welfare reform in the past ten years demonstrates that low-income women want to work and provide better futures for their children. Yet, some parents require more assistance than others. While short-term job assistance has been effective for many former welfare recipients, those who face serious barriers to entering the workforce require greater attention and ongoing support even if they are successful in finding low-wage work. Blank, Rebecca M. 2007. “Improving the Safety Net for Single Mothers Who Face Serious Barriers to Work.” Future of Children. 17(2): 183-97. Loprest, Pamela. 2003. “Disconnected Welfare Leavers Face Serious Risks.” Snapshots of America’s Families III, no. 7. Washington, D.C.: Urban Institute. Pavetti, LaDonna A. and Jacqueline Kauff. 2006. “When Five Years Is Not Enough: Identifying and Addressing the Needs of Families Nearing the TANF Time Limit in Ramsey County, Minnesota.” Lessons from the Field. Princeton, NJ: Mathematica Policy Research. Turner, Lesley J, Sheldon Danziger and Kristin S. Seefeldt. 2006. “Failing the Transition from Welfare to Work: Women Chronically Disconnected from Employment and Cash Welfare.” Social Science Quarterly. Vol. 87(2): 227-249. Rebecca M. Blank is a Visiting Fellow, Economic Studies at the Brookings Institution; co-director of the National Poverty Center; and Professor of Public Policy and Economics at the University of Michigan. Brian K. Kovak is a graduate student in the Department of Economics at the University of Michigan. The National Poverty Center’s Policy Brief series summarizes key academic research findings, highlighting implications for policy. The NPC encourages the dissemination of this publication and grants full reproduction right to any party so long as proper credit is granted the NPC. Sample citation: “Title, National Poverty Center Policy Brief #x”. Major funding for the National Poverty Center is provided by the Office of the Assistant Secretary for Planning and Evaluation, U.S. Department of Health and Human Services. Any opinions, findings, conclusions, or recommendations expressed in this material are those of the author(s) and do not necessarily reflect the view of the National Poverty Center or any sponsoring agency.